SoftPlanet makes it possible for everyone to get free FlashFXP download directly from our servers. There is no registration needed for downloading. FlashFXP 4.4.4 Build 2046 is a software application, designed to manage your file transfer. This FTP/FTPS/SFTP client is secure, reliable and very efficient. It is a great substitution to most popular software on the market. 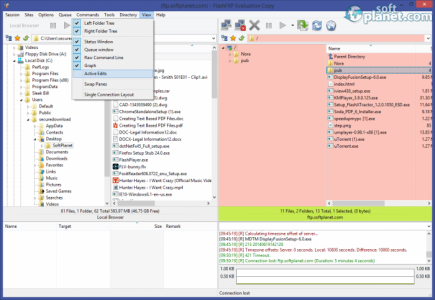 FlashFXP shines with a very extensive feature list too. Check out its capabilities down below. FlashFXP's features can be divided into six different categories – Performance, Security, Connectivity, Interface, Webmaster Tools and Integrity. Some of the key ones, which really make this app to stand out from the crowd are on-the-fly compression, a file transfer scheduling system, a skip list, remote file editing and automatic upload on save, etc. FlashFXP offers a Windows-Explorer-like graphical user interface. Fortunately, the main window of the app is divided into sections. Thus you have your local browser and remote server opened simultaneously. In addition, the layout of FlashFXP can be customized in different ways in order to get the most appropriate view for you. Fortunately, the app supports drag-and-drop file transfer, which makes its very intuitive and simple to use. The lack of a file transfer size limit is another great thing about FlashFXP, which should make you choose it instead solutions on the market. In addition, keep in mind that the program is multilingual and comes with translations in over 20 languages like Bulgarian, Chinese Simplified, Chinese Traditional, Czech, Danish, Dutch, English, Estonian, French, German, etc. 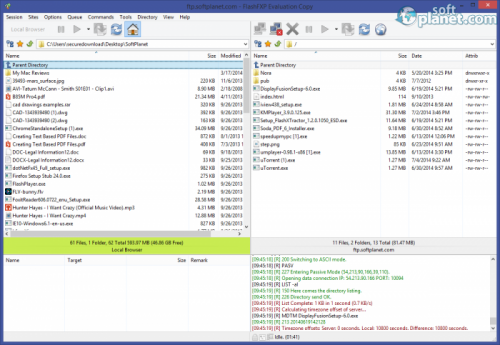 FlashFXP 4.4.4 Build 2046 is an extremely powerful FTP/FXP client, which can compete with all big players on the market. Please do not hesitate to share your personal observations with us. Our security scan shows that FlashFXP is clean from viruses. The current version of FlashFXP has been scanned by our system, which contains 46 different anti-virus algorithms. That ensures that FlashFXP 4.4.4 Build 2046 is 100% safe for your computer.